The Kingdom of Saudi Arabia has no doubt demonstrated its commitment to reforming infrastructure and building a diversified economy in recent months. Fast paced changes across several socio-cultural and business sectors have taken the world, and even most Saudis, by surprise. The Kingdom’s ultimate goals are to develop its business environment, encourage investment and accelerate economic development in accordance with Vision 2030, quickly and efficiently. However, as the country works towards diversifying its economy and developing its public service sectors under Vision 2030, has the judicial system been able to keep up? Under the Saudi Government’s National Transformation Program (NTP), launched to help achieve several high-level reform goals, the Ministry of Justice has developed initiatives to improve the judicial system in Saudi Arabia. Key performance indicators set forth by the Ministry aim to increase efficiency, speed, resolution satisfaction and the volume of cases in an effort to improve Saudi Arabia’s World Bank institution ranking. But where does Saudi Arabia stand when it comes to legal reforms? If we take a look back at when reforms started taking place, the first changes began in 2007 when King Abdullah issued a number of royal decrees setting in motion first steps to renovations in the Kingdom’s legal system. This included the establishment of the Supreme Court as the highest judiciary authority, the Board of Grievances (BOG) which oversees the Administrative Court system and new individual Courts of Appeals assigned to specific Saudi Arabian provinces. September 2017 witnessed the Ministry of Justice establish a more direct relationship with the independent courts through the Commercial Courts in Jeddah, Dammam and Riyadh. Commercial Courts were regarded as the beginning of a new era for the Saudi judicial system, providing certainty and speed of process for participants and directly tackling the system’s jurisdictional challenges. Since then, the judicial system has entered a new phase of growth, with the most recent adjustments coming in place in February 2018, providing further guidelines to Civil Procedure Laws. The new rules were aimed at restructuring existing litigation procedures to ensure efficiency of commercial proceedings and quality rulings issued by the Commercial Courts. The new rules have specified timelines on hearing dates, the maximum number of hearings for commercial cases, regulations on first hearings and on documentation. 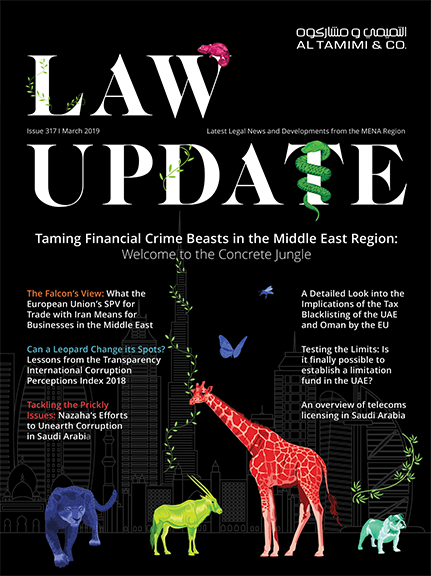 These reforms have been supported by new laws, under review by the Saudi Board of Experts, to impose court fees in an effort to reduce the number of the spurious cases being brought before the courts; encourage settlement of cases outside court and the use alternative dispute resolutions such as mediation. The pace and breadth of these reforms showcase a strong commitment by the Kingdom towards building a robust legal system as part of a move to fully realize and implement Vision 2030. As major strides are being taken into effect to align the legal landscape with Saudi Arabia’s transformation plan, it is expected that further reforms, like the shift from a paper-based to an electronic system will take place to streamline delivery and access of information. These changes will undoubtedly be supported by further transformations ensuring that a reformed legal system in Saudi Arabia is well on its way to provide the proper judicial infrastructure for Vision 2030. Al Tamimi & Company is dedicated to providing localised support for companies operating across the region and within their designated markets. The latest initiative to support this effort is the upcoming Saudi forum, Foreign Investment in the Kingdom: The Road to 2030. With over ten years of experience in the Kingdom, Al Tamimi & Company has established deep-rooted knowledge of the legal and legislative developments within the Kingdom to support clients across various sectors. As Saudi Arabia undergoes extensive business, economic and social developments, Al Tamimi & Company is launching its first bespoke forum to offer the opportunity for the Kingdom’s industry leaders to participate in discussions surrounding the evolving legal landscape and shed light on best practices related to legal compliance. Taking place in Riyadh on April 24th, 2018, the half-day event will address topics that surround regulations related to; privatisation efforts, setting up and sustaining businesses in the Kingdom, and cybercrime and security. Panellists and speakers at the event include Khalid Abdullah Al Hussan, Chief Executive Officer, Tadawul, Dr. Eman Al Mutaiari, General Supervisor, Tayseer and Dr. Ahmed Kattan, Deputy Minister of Labour Policy.